My posts have been pretty grim these days with two of my recent articles addressing the possibility of nuclear blitzkrieg and high tech coup d'etats. Undoubtedly, the situation with North Korea has a lot to do with this. Consistent with this apocalyptic tone, Letter From Here blogger Madison Guy recently dropped me a note linking to his article, "Dr. Strangelove, please keep an eye on your toys. Your grandchildren are getting forgetful". Guy claims that the conception of nuclear weapons as an existential threat has been significantly diluted in the public consciousness since the end of the Cold War. There's a strange sense these days that nukes aren't all that bad and that the human race could somehow survive atomic warfare. I'm sure this conception will change over the coming years now that the threat of nuclear war is cajoling us out of our denial. But just as a reminder as to how nasty nuclear weapons are, I'd like to mention a few things about a bomb the Soviets developed back in 1961. 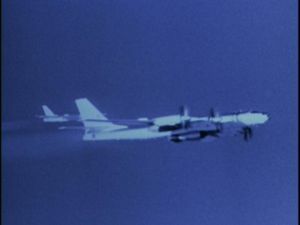 At 27 metric tons, it was impractical for warfare purposes; a Soviet Tu-95 bomber had to be retrofitted so it could carry the bomb, which protruded out of the bomb bay doors. The plane also had to have special reflective paint to minimize heat damage from the inferno. 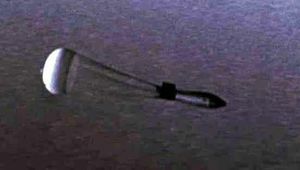 And to help the pilots get away in time, the bomb was given a parachute to ensure a slow descent. This enabled the bomber and the observer plane to be as far away as 45km from ground zero. 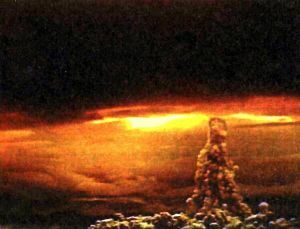 The Tsar Bomba detonated at 11:32 a.m., located approximately over the Mityushikha Bay nuclear testing range, north of the Arctic Circle on Novaya Zemlya Island in the Arctic Sea. The bomb was dropped from an altitude of 10,500m and detonated at a height of 4,000m over the land surface. Soviet sources claimed that the yield was 50Mt, but US estimates place it as high as 57. The fireball itself touched the ground and reached nearly as high as the altitude of the Tu-95 bomber. The explosion could be seen as far as 1,000km away, but it took 49 minutes for the rumble of the explosion to arrive at that distance. The heat blast was capable of causing third degree burns at a distance of 100km. The subsequent mushroom cloud was an astounding 60km high (practically into space) and about 30-40km wide. Tsar Bomba's seismic shock was measurable even on its third passage around the earth. Radio communications were disrupted for nearly an hour as a result of the ensuing ionization. The fission-fusion process of the detonation lasted about 39 nanoseconds, during which time about 5.3×10^24 watts (or 5.3 yottawatts) was expelled. Put another way, it was equivalent to approximately 1% of the power output of the Sun. The maximum yield produced by a US bomb was 25mt, making Tsar Bomba the most powerful device ever utilized by humanity. Soon after the explosion, Khrushchev warned of the existence of a 100mt bomb. 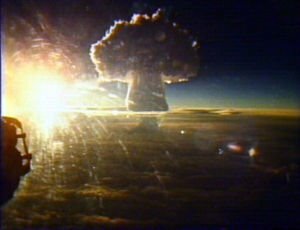 In fact, Tsar Bomba was initially designed to detonate at 100mt, but the Soviets were rightly worried about massive fallout and the inability of the bomber to get away in time. Consequently, they deliberately halved its power. A Soviet team was eventually sent to check out ground zero. According to the article, "The Most Powerful Bomb Ever Constructed", one witness reported: "The ground surface of the island has been leveled, swept and licked so that it looks like a skating rink. The same goes for rocks. The snow has melted and their sides and edges are shiny. There is not a trace of unevenness in the ground… Everything in this area has been swept clean, scoured, melted and blown away." The area of complete destruction had a radius of twenty-five kilometers from ground zero. A bomb with such yield was eventually considered to be impractical. It was too large and heavy, there was significant risk of residual fallout, there was a high risk that the plane would not arrive at the target, it was inaccurate, and the advent of ICBMs made such a design obsolete. But as an indicator of just how apocalyptic nuclear weapons could be, Tsar Bomba certainly made a statement. Any city could be completely erased from the planet by dropping one of these behemoths on it. Consequently, if anyone still thinks that nuclear weapons are merely 'bigger' bombs, think again. They truly represent a threat to our ongoing presence as occupants of this planet. Anyone who has witnessed an above-ground nuclear test would have to be at least in their 60's by now, because an international treaty in 1963 outlawed them. All the nuclear-capable nations, including the allegedly untrustworthy Soviet Union during its existence, have complied with it so far. Above-ground nuclear testing, which made the prospect of nuclear war feel vividly real in the 1945 - 1963 period, stopped so long ago that several new generations have reached "maturity," so-called, with no concept of what nuclear weapons can do. By now nukes must look like something out of 1950's science fiction, or otherwise like a neat retro-future hack our fathers and grandfathers designed and built using sliderule calculations. 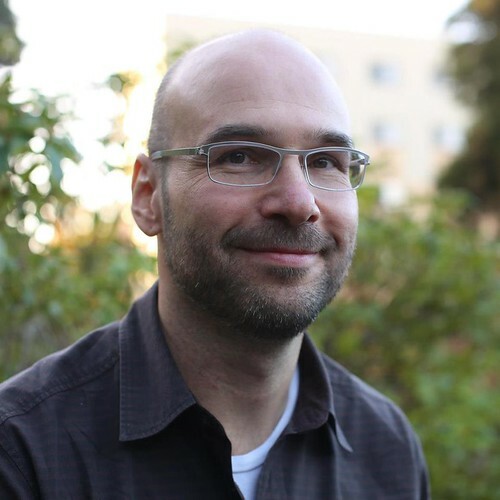 Most people today just have no clue what this technology can do because the effort to control it has also shielded us from a visceral knowledge of its effects.